Pre-heat your oven to 180°C (350°F) or Gas Mark 4. Mix together flour and oregano, and season with black pepper. 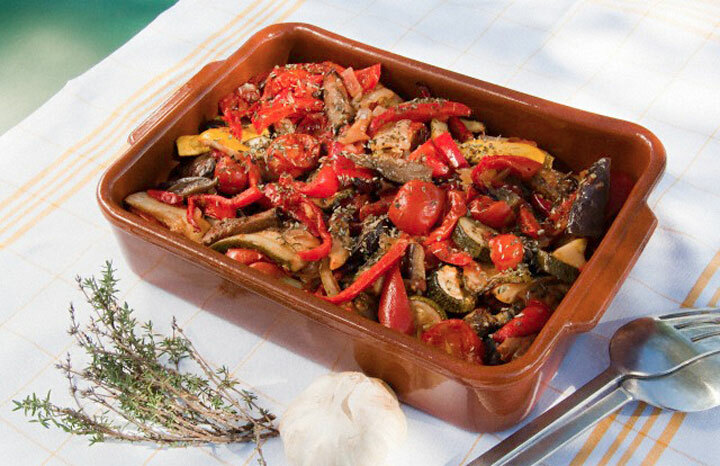 Slice all the vegetables, cutting aubergine into 1cm (½in) thick slices. Coat aubergine on both sides in seasoned flour. Heat 1 tsp oil in a non-stick pan and, over a medium heat, brown aubergine on both sides. When cooked, place in an oven-proof dish. Add a layer of the other vegetables and top with the cheese. Cut potato into 2cm (1in) cubes, toss in rest of the olive oil and place on a baking tray, adding herbs such as rosemary or thyme if you wish. Place both dishes in oven and cook for 30-40 minutes. Recipe from Yours Diet Club.